The first two things I imagine whenever I think of Chowking are Halo-halo and Congee. I have been craving for a bowl of Halo-halo and a bowl of hot Congree for two years and when I've finally gotten the chance to spend my vacation in the Philippines, the first thing my boyfriend and I have tried to look for is a Chowking place. The first three days of our stay were spent going through every boutique and department stores of the SM North EDSA and SM Mall of Asia. I wanted to have my Chowking favorites even on the first day however, Chowking places had been overflowing with people all the time. Not wanting to squeeze inside too much populated Chowking restaurants, I decided to wait until the day we found one where we could at least breathe in and move a bit. During the fourth day, we decided to check again some boutiques we missed at the SM North EDSA and ended up spending the day at the TrinoMa Mall instead. You can read the full story here. To make a long story short, between 2 and 3 in the afternoon we noticed a not so busy Chowking inside the TrinoMa Mall. Excited, we went inside at once, placed our orders and patiently waited for our food to be served. The waiting wasn't that much which was perfect for someone craving for Halo-halo and Congee like me! On the other hand, my boyfriend ordered dumplings, chicken noodles, siopao asado and a large glass of pineapple juice which he found fulfulling. 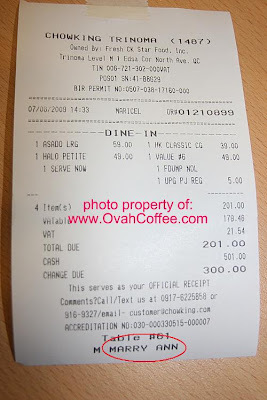 on the photo below: my petit Chowking Halo-halo which gave me "brain-freeze" after eating all of it on the photo below: our Chowking TrinoMa receipt. The entire meal didn't cost us that much which truly surprised us. Oh my... the lady who took our orders mispelled my name big time! Mary Anne was changed to Marry Ann in an instant. Well who cares, right? I got what I wanted anyway! No big deal! I am again missing Chowking! I don't know how much is the bill....kay libre man me ato nila ermat ug erpat...hehhee....:) brain freeze man jud lagi dayon....:) wala diay chowking diha? naa man dire sa amo..pero never been to...mahal man jud dire...wait nalang ko makauli me puhon sa pinas...lol! hello dhemz. wala chowking diri sa sweden ui. wala gani jollibee ug KFC. dili yata makaya ang tax. perti kamahal. yup. 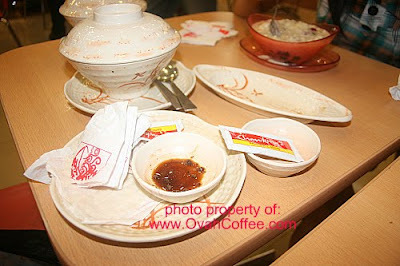 it was really cheap to go to chowking sa pinas. will surely go there again one day kapag nakauli napud. hehe. kumusta.wow chowking, sus gimingaw naman pod ta ani oi.I miss halo halo kung pwede lang magbuhat sariling halohalo dri ba during snow time dugay ra nako gibuhat hehe. dri sa sweden wala man gud sila ani oi, kay mahal man gud tax so dili makadali dali og negosyo. gitudo na jud ninyo ang inyong vacation sa ato no? how long ba mo didto sa ato Max? one month mo didto no? Recent blog:=- Happy 4th birthday Erik! hello ate weng. 3 weeks lang mi sa pinas ug 5 days sa hong kong. gitodo jud namo ang bakasyon namo ate weng ui. kay next year pa masundan. hehe. korek ka ate weng. di makaya basta basta ang tax diri kung magnegosyo sa sweden. miss halo halo na jud! Recent blog:=- Hire A Respected Colorado Attorney In Your Area! i miss and love Lauriat sa chowking....waaah! hello Monica! thank you very very much. hugs! by the way, already added your blog in my blogrolls, too. thanks. and yes, it sounds really cute! 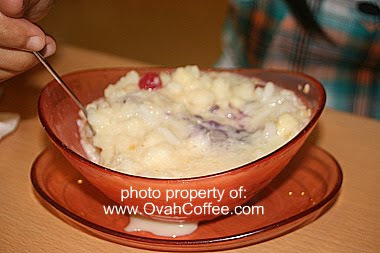 it's a mixture of crushed ice, some fruits, beans, milk, sugar and leche flan. halo-halo is a filipino word which means "mix"
ay. bakit naman depressed ikaw prenship? hope okey ka na and sana okey na broadband connection mo soon. ay meryl. kainggit talaga! grabe. hehe. i like lauriat, too pero minsan ko lang orderin sa chowking yun. hehe.